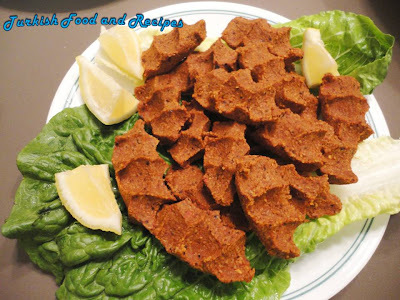 I'd like to thank to Tarik, the master of cig kofte, for this delicious recipe. Process the onions in food processor. Then, take it along with bulgur in a large mixing bowl. Rub the mixture in between your palms, to give bulgur a full onion flavor (about 10 minutes). Add pepper paste/ pepper and tomato mix paste, salt, isot and cumin. Keep rubbing all the ingredients in between your palms pressing hard. Then, add the ground beef and push the mixture through the bottom of the bowl strongly. Dip your hands in cold/ ice water occasionally to ease the process. Keep kneading for about 30 minutes and make sure the bulgur is softens enough. Meanwhile, crush tomato and garlic in the food processor, and then add into the bulgur mixture. Add lemon juice and canola oil as well. Knead for a couple of minutes and grab walnut size pieces or bigger if desired. Place them right inside your palm and squeeze gently to give the right shape as seen in the picture. Serve with lemon wedges and lettuce leaves. This recipe yields to 120-130 pieces of cig kofte. 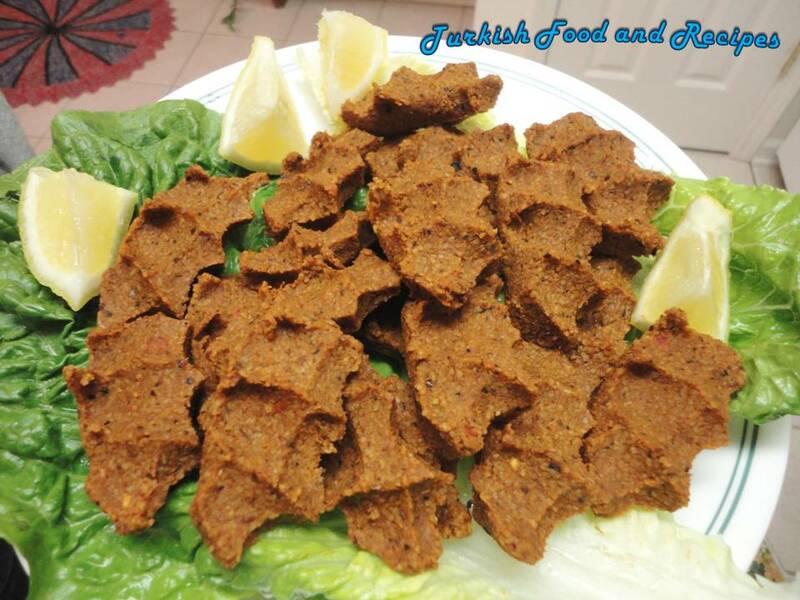 Bu harika cig kofte tarifi icin ustamiz Tarik'a tesekkur ediyorum. Sogani mutfak robotunda guzelce pure haline getirin. Bulgur ile sogani genis bir kaba alin ve iki avucununuzun arasina alip ovalayarak guzelce birbirlerine yedirin. (Yaklasik 10 dakika). Biber ya da karisik salca, tuz, isot ve kimyonu ilave edin. Bir sure daha iki avucunuzun arasinda doverek malzemeleri yedirin. Kiymayi da ilave ettikten sonra butun gucunuzu kullanarak elinizin tabaniyla kabin dibine iyice bastirarak yogurun. Arada elinizi buzlu su dolu bir kaba daldirip cikarin. Yaklasik yarim saat kadar yogurarak bulgurun yumusamasini saglayin. Bu sirada domates ve sarimsaklari mutfak robotundan gecirin ve kiymaya ilave edin. Limon suyu ve kanola yagini da ekledikten sonra bir kac dakika daha yogurun. Ceviz buyuklugunde ya da arzuye gore daha buyuk parcalar alin ve avunucuzun icinde sikarak cig kofte seklini verin. Yaninda limon ve marul yapragi ile servis yapin. Bu tariften yaklasik 120-130 cig kofte cikar. Yes it is okay to eat the raw beef. You can eat beef uncooked it's not chicken. In any case, the acidity in the lemon to a certain extent cooks the beef if you understand. In any case you can eat rare steak which essentially is uncooked beef. You can make this recipe without the meat anyway, I prefer it this way (etsiz - without meat). Beğendim! Harika dir! Italya dan selam! I'd probably change the oil to olive oil, but aside from that, it sounds perfect! I'd also add that it would be wise (and safer!) to grind your own beef. Beef processed through the grocer is mass-produced and not intended for raw consumption (the expectation is that most people will cook it and refining the process to raw-standards is unnecessary). To the previous comment that noted that the lemon juice's acidity "cooks" the meat - this is simply untrue. If the beef is not properly handled, you are more likely to get sick, regardless of how much lemon juice you use. Besides, the meat really should be ground twice to get that really fine texture, so either way, it's up to the chef to grind the beef! You also might consider combining the beef with lamb as well, to go a more authentic route! Happy (and safe!) cooking to all! I have been eating these since childhood and never got sick. Just ask your butcher(whether its a supermarket butcher or an artisan butcher) to make very lean ground beef for steak tartare and ask for it to be as fresh as possible. Furthermore, if you buy unfrozen, fresh lean beef to ground, it is likely that it will be okay to eat raw; some people simply show the meat to a pan, without leaving it on to cook thoroughly. Do you cook the bulgur beforehand? You don;t need to cook the bulgur. Once you are mixing all the ingredients, bulgur will soak up the moisture and become edible. That's the unique part of "cig kofte"